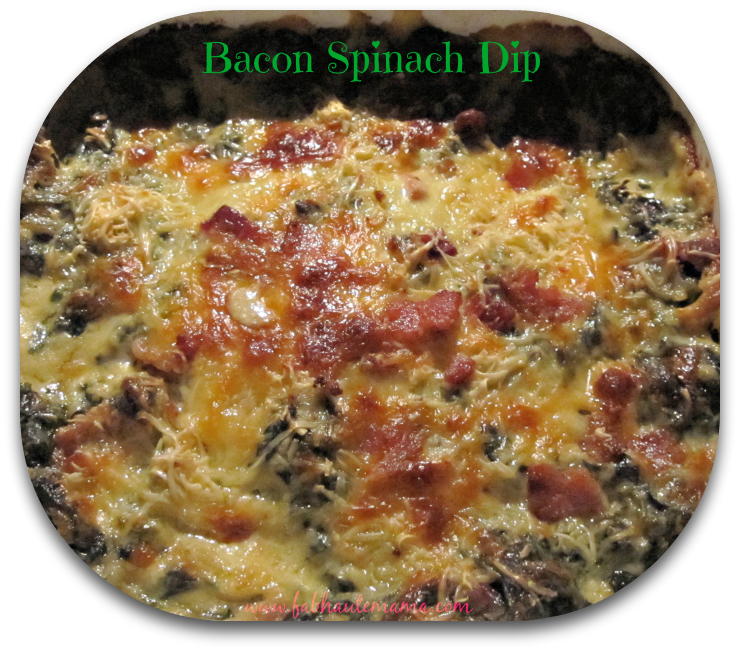 I’m not a fan of cold weather but so many of my favorite recipes to make are fall staples. I jazzed up my banana bread recipe this year by adding some apples from Apple Picking trip. Then I threw in some raisins and some of my favorite spices for good measure. 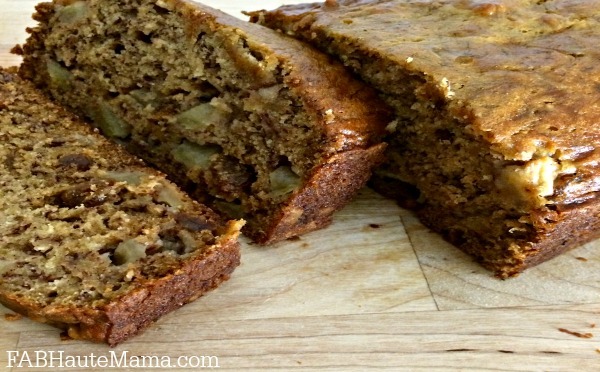 When all was said and baked we enjoyed this Easy Banana Apple Bread. It was so good! I had to hold myself back otherwise that banana apple bread would have been a distant memory to me and not so nice secret from the Hubs and Sugar Plum Z. Do you know how hard it was to bake in the evening while the Hubs was at work and Z was tucked in for the night. HARD! And that’s not factoring in my hormones. In my haste, I poured the bread into the pan only to realize I left out a key stabilizing ingredient. As a result my bread did not rise to it’s to true glory. The culprits: Overmixing and just plain old greediness. As if it wouldn’t take an hour to bake. Tisk, tisk. I will have to bake it again just to grab pics of all the glory. Who am I kidding? I want more. That’s the real excuse. This bread is perfect for breakfast or for an evening treat. 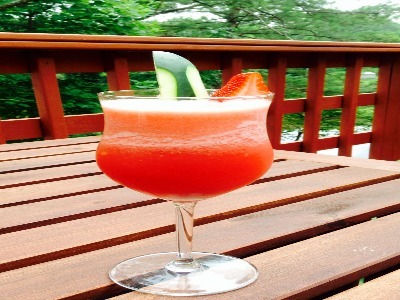 I enjoyed mine with coffee one morning and tea in the evening. I also had a slice all by itself. It didn’t need a companion. Obviously I have no shame and I loved this bread. One last thing, practice says to cool completely but after the initial 10 minutes I dug in. Do what works for you. Fall Into Fall with this simple Banana Apple Bread Recipe. 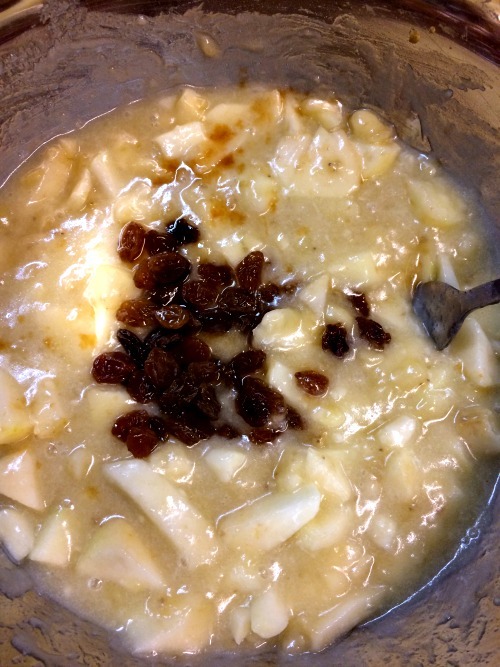 Mix bananas, apples, raisins, sugar, egg and vanilla in bowl. Lightly fold the dry ingredients into the wet ingredients. 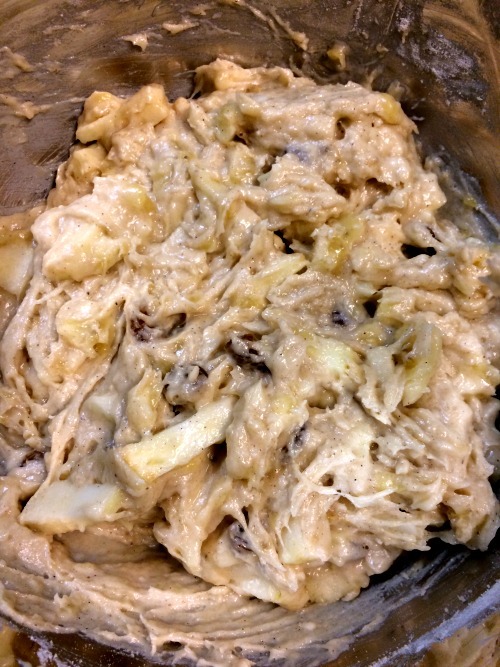 Place bread mixture into a lightly greased loaf pan. Bake at 325 for 1 hour or until center is done. Cool in pan for 10 minutes then transfer to cooling rack. Let cook completely before slicing. 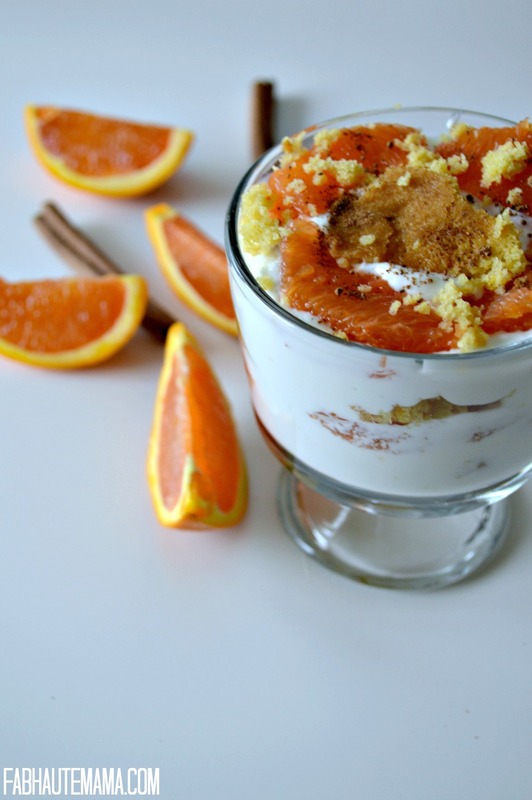 What are some of your favorite fall baked recipes? Share a link below so I can spread the love. Your bread sounds really yummy with the apples added! Pinned it to my Breads board so I can make your recipes next time I make banana bread. Would love for you to share with us at the Home Matters Linky. Hi Shirley. Thank you. It was so easy and good. The apples definitely added a little bit of extra goodness. I’m hoping to linkup with your party over the weekend. 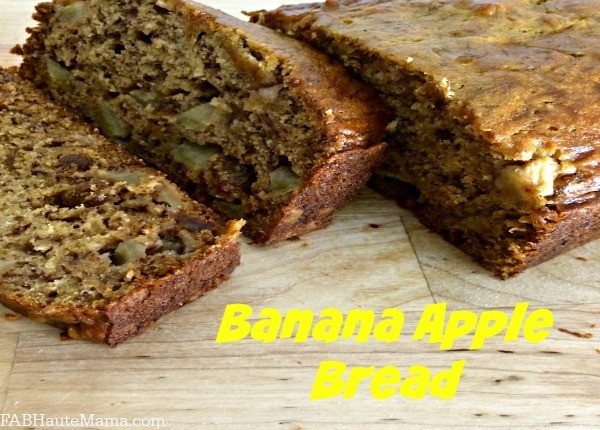 I never thought to use apples with my banana bread. This sounds delicious and I bet smells delicious. Thanks Aimee. The apples definitely added a nice touch. As for the smell, I almost didn’t have the patience to wait for it to bake. The smell was calling me. This looks AMAZING! 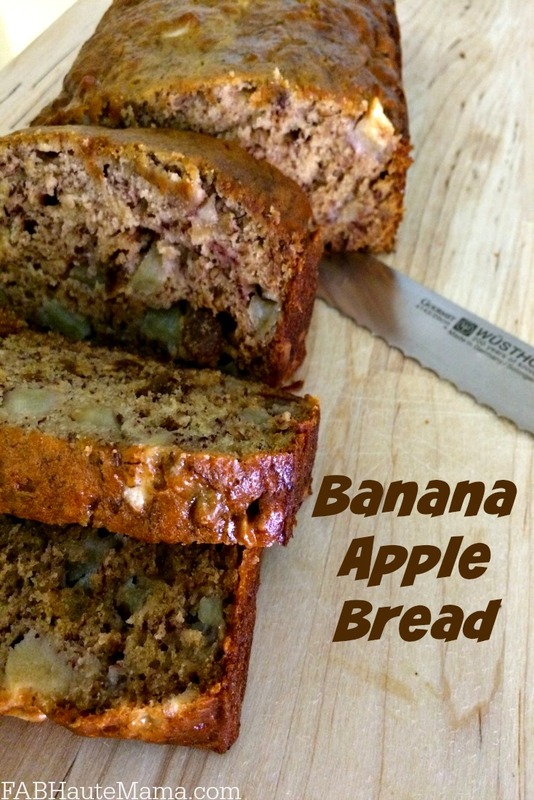 I love banana bread, but adding the apples is great idea I haven’t tried! We went apple picking for the first time with our girls this year and will add the to our apple recipes. I pinned it to try later. Go for it Sarah. The apples just take the bread over the top. Wasn’t apple picking the best! We really enjoyed it. It was hard picking pictures for that post. Thanks for stopping by. LOL Vee. You know little additions especially spices are a must! I’m pretty sure my cinnamon and nutmeg get the most love in the spice cabinet. They make all the difference. Oh girl if I didn’t love that man that banana bread would have been gone! LOL. The cravings struggle is real.